"Are you sure he's not dead?" Miko says, poking the elder monk in his forehead. The monk sits as still as a statue, strings of kelp rising from his outstretched fingertips, a small patch of coral polyps clinging to his cheek. Several crabs now call the crevices beneath his crossed legs their home. "No touching, Miko," I say. "Please stop acting like an upworlder and reserve some respect for your elders." "How long has he been sitting like this?" asks Chessa, my star pupil, timidly waving her hand in front of the monk's distant stare. The only things that move are the flecks of plankton floating in the ocean water. "That is the riddle. Anyone care to solve it?" I ask. I reverse my fin rotation and drift backward, giving my clutch room to examine the monk from all angles. "Days? Weeks? Years?" I laugh as the students swim about, darting this way and that as they turn over shells in hopes of finding a clue. Young ones, always in such a hurry, like a school of razorfish. My smile fades. I love these students, I do, and I'm proud of all the work they've put in, but doubt grips me hard as I count them, over and over, making sure no one's wandered off. Just eight students this year, not much of a clutch. Last year, there were fourteen, and the year before, twenty-two. And before that, I was turning students away for fear I wouldn't be able to keep an eye on them all. Times are changing, and parents are seeking out clutch tenders who side with the Adaptationists—those using bioengineering and other Upwelling principals that have floated down into our oceans through the Simic zonots. I've tried to avoid the political meanderings of the upworlders as much as I can, clinging to the ways of our ancestors, and training students to protect our waters with the same techniques we've used for millennia. A zonot is a huge sinkhole that leads all the way down to the Ravnican oceans, and each serves as a distinct Simic habitat—sort of an oversized, inverted skyscraper. Each zonot has a different culture, ecosystem, and racial distribution, as well as a speaker. Kaszira sits slumped on the fringes of the class, moping as always. I've seen the way she eyes the students in the other clutches, admiring their lab-elongated fins that increase swimming speeds, their high-end skin adaptations that grant them camouflage rivaling the best ocean mimics, or their enhanced vision that enables them to spot invaders before they infiltrate merfolk territory. Some parents have even supported more advanced modifications such as claws to help defend our waters, but their numbers are still few, thank the gods. "Kaszira," I call. "Come over, you're missing out on the lesson." She doesn't respond. I've tried over and over to connect with Kaszira, but her heart just isn't in it. As I swim closer, her eyes flick toward me, then focus on something in front of her. A zooplankton. A dead one. Kaszira's eyes cross as the tiny carcass settles upon her nose. 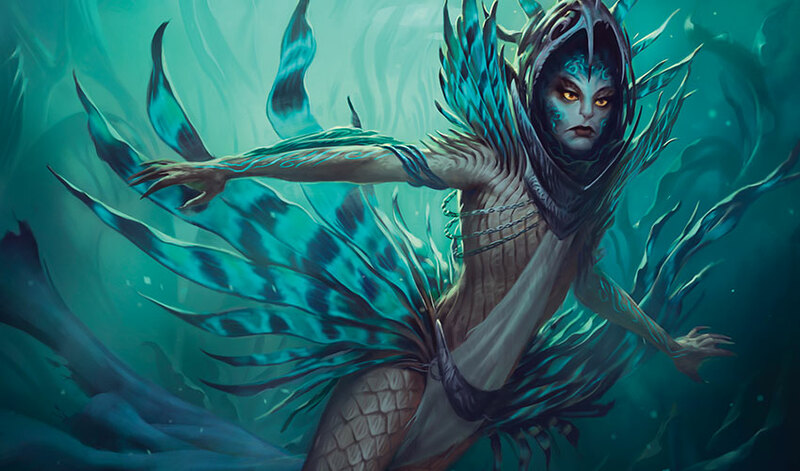 She looks so much like Utopian Speaker Zegana—a younger, more petulant version of our leader, sure, but the resemblance is uncanny: a showy spray of fins (blue with iridescent bands), a thinness to her body that would be unbecoming on most merfolk, but she wears it well. I'd dare call her regal if she'd bother not to slouch so much. As a second dead plankton settles upon her skin, I realize, she's not moping. She's observing. I stop and tread softly in place, not wanting to disturb her. A third plankton lands upon her, and then she turns to me and says flatly, "Seven weeks. That's how long the elder monk has been meditating." My eyes widen. How could she possibly have seen the clue to the riddle from this far away? The children were meant to measure the width of his fasting bands and compare those to the width of his dorsal bands and come up with forty-seven days. Just shy of seven weeks. "I was going to say that!" says Chessa, swimming over and presenting her rockfish spine as evidence, accurate as any upworlder ruler. "I swear on my grandmother's gills!" "Yeah, I was going to say it, too," Miko mocks. Poor kid hasn't solved a single riddle since he's been under my care, but what he lacks in observation skills, he makes up for in courage. The other students all love his antics and join in, laughing. I hush them. "Kaszira was first with her answer. Please allow her to explain." "In ten minutes, seven dead plankton landed on me. Which works out to forty-two per hour. And with an average zooplankton size of one-eighth of a rockfish spine, it'd take about a thousand of them to make a uniform coating on an undisturbed surface the size of a square-fin. The coating on the monk's skin sits at six layers at its thickest points—his nose, the tips of his cheekbones are the most obvious. That works out to seven weeks. Or just shy of it." She swats the plankton from her face, then the glazed look of boredom settles back onto it. "Very keen observations. We'll make a fine protector out of you yet!" I say, hoping my encouragement will spark empathy in her heart. Oh, how I wish for her to wonder about the enormity of the sacrifice the monk has made in all that time, but none of that comes. I sigh. "Now, the other way you could have determined this—" I reel out my own fish spine, a bronzed antique with pearls set along the ridge, and get ready to show the class the traditional way to solve the riddle. "Woah!" Miko says, jaw dropped. It takes a moment for me to realize he's not marveling at my ruler but at Ptero Zallik, senior clutch tender and bane of my existence. I'd heard the rumors, but I couldn't believe he'd actually gone and done it. His entire torso looks to be crustacean in origin, now, rust red and bumpy all over, his arms ending in enormous pincers. "Fine current you've got here, Medge," he says to me, flexing his new body parts and fishing for a compliment. "It was until you decided to swim into it," I mumble downstream, then wrench a smile onto my face. "Greetings, Ptero. You're looking dapper. Don't tell me . . . trimmed your fins?" He laughs as his clutch swims up behind him. Twenty-seven of them. And twenty-seven million years' worth of Utopian evolution between them if you added up all the Simic modifications. "Still teaching about fasting bands? I thought they'd nixed that from the curriculum centuries ago." "It still has relevance for those who wish to take the time to learn it," I grumble. "Well, I'm sure you have plenty of time to spend one-on-one with your pupils. A blessing from the old sea gods, for sure! I've got my claws completely full now that my class is absolutely brimming with students. Only sixty-two protectorate positions are open this year, and twenty-four of mine are sure bets—masters of empathy, courage, and observation. But now that I've gotten a good look at the competition, I'm thinking I can place all of them." "Sixty-two spots?" I bristle, my fins flexing in agitation. "I thought there were eighty." "The Guardian Project has decided to send in some reinforcements. They're taking eighteen spots. Frog mutants, I think. They're breeding them like guppies these days!" "But this isn't a Simic issue. It's a merfolk issue!" They know next to nothing about the ways of the deep. "Vannifar's orders." Ptero shrugs. "See you at the winners' shell." He snaps a pincer at me, coming inches from nipping a fin. "That is, if any of yours show well enough." And with a whip of those muscular, lab-enhanced thighs, he and his clutch barrel off into the currents. Sixty-two spots. There are a hundred and seventy pupils between all the clutch tenders. Odds were, I'd sneak in at least a few, but with eighteen fewer spots, those are no longer a guarantee. If none of my students have a good showing, I might as well toss my shells to the surface right now. I'd be washed up. Done for. No one would ever entrust me with their children again. But I can't let my negativity rub off on my students. I need to instill all the confidence in them that I can. Ptero was right about one thing, I have the advantage of a small clutch size, and I intend to use it. I'd never dare to take twenty students outside the protection of merfolk territory. Or even fifteen. But eight is few enough that I can keep a close eye on all of them, and the experience of the open ocean will be worth it. To see an elusive krasis in action, to watch how they move. To see them attack. It could give my students a fin up during their showings. "Come on," I say, taking off so quickly that sand kicks up from the sea bed. The students raise their brows in curiosity. "Stick with me. Stay close!" We'll be safe, watching from afar. I wouldn't dare put any of them in actual danger. We swim deeper and deeper into the depths, following a forest of golden kelp stretched down below us, the resplendent coral castles of our home now looking like mere sandcastles upon the horizon. An amphibious beast lumbers, the resplendent benthid, one of the leviathans of the deep that call our sea caves home. We pass under it, Miko running his fingertips upon the beast's soft, slime-coated underbelly. The resplendent benthid has spent thousands and thousands of years with no natural predators. But now the unnatural kind lurk about . . . Finally, we see the elusive krasis—an abomination of nature: claws, scales, and deadly spines running down its serpentine tail. The biomancers who'd created them had underestimated how tenacious they were, how smart they were, escaping their enclosures and finding their freedom in our oceans. They say they're fish mutants, but I've never seen a fish with a neck so thick and taut, or with a head baring the stare of an empty skull. I command the students to take cover in the kelp forest, and I press them further and further back as the krasis gets closer and closer to us. Suddenly, we're pinned up against the hull of an old wreck, waterlogged wood creaking at the slightest touch. We hold still. This is where we will make our observations, and pride swells within me as my students cross arms without my instruction, one of the first lessons I'd taught them, so long ago it seems. This technique conceals where one student ends and the next begins, fins overlapping, making us blend in with our surroundings. Then we watch, my heart pounding as the elusive krasis sets its sights on the resplendent benthid we'd just passed. Poor beast doesn't even know what hits him. The benthid manages to puff up in defense, vocal bubble shining bright red—the perfect target. A stinger erupts from the tip of the krasis's tail and strikes a killing blow on the beast's soft underbelly. Then the krasis gorges, clawed hands shoving flesh into its skeletal maw until it's had its fill. The bloodied water attracts other krasis, and they feast as well, and just when the carcass is picked clean minus a few undesirable bits, they spot another amphibious beast in the distance, and swim off after it. "That is what we're up against," I say. "We can protect the creatures that live within our territory, but out here, we haven't the resources, the time, to protect them all." "We could have tried to do something," Miko says, face drawn in horror. "Fluxmagic or some sort of fathom spell . . ."
"Not out here. The danger is too great. You never know what is wading right around the—"
"Passss . . ." rasps a voice from behind us—a dry, brittle, and eerie voice, like nothing that belongs in the sea. "Passs . . ."
The class looks at Miko, expecting it's another of his practical jokes, but he shrugs, and says, "Wasn't me. I think it came from inside the wreck." He rubs his hands against the bow. Not Simic, from what I can tell, but definitely from the upworlds of Ravnica. "We should investigate," he says, one foot already stepping through the giant hole in the hull. "It's too dangerous," I say, pulling him back. "We'll report it to the Guardian Project and let them deal with it." "But the voice. What if they're hurt?" Kaszira says. "Passage . . ." rasps the voice again. I grimace. We are protectors of life. I've asked the students to set aside their call to action once today. To do it twice, and for the life of a living, breathing person, would all but negate the bravery I've worked so hard to instill upon them. "I will look inside the wreck. I'll need two volunteers to come with me." I look toward Chessa, my best student, but she looks away. I could really use her keen observation, but when her courage falters, so do her other skills. Miko thrusts his hand up, though. No big surprise. I've poured so much of my energy into trying to mold that kid into a proper protector, but his mind's got the constitution of seabed sand. Still, his heart is in the right place, and he never backs down from a fight . . . something that could come in handy should the situation take a turn for the worst. Kaszira's hand shoots up as well, which catches me by surprise. I've never seen her so interested in anything before, but then again, I'd never seen her around an ancient wreck from an exotic world. She wouldn't be my first choice. My second, or my third, but I consider her as well. I'm not proud to admit it, but ever since I learned she was Speaker Zegana's niece, I've kept a close eye on her, finding ways to encourage her natural strengths. She's a longshot for the winners' shell, but if she does well enough, perhaps the judges would be swayed by her lineage and pass her through. "I choose Kaszira," I say. "And Miko." Chessa looks relieved, but I don't let her off the hook and assign her to lead the watch group while we are inside. So Kaszira, Miko, and I swim into the mouth of the breached hull, into darkness, the iridescence of our fins bathing the surfaces with deathly quiet light. There's a small hold packed with storage barrels, and between them, various sea creatures have found suitable dens. A ladder missing most of its rungs leads up to the deck. We push at the hatch door and instead of opening, it crumbles into splinters. "Eighty years," Kaszira whispers, rubbing a finger through a thick coating of zooplankton skeletons upon the toppled beam that once held the ship's sails. "That's how long this wreck's been down here." "But the zonots haven't been open to the ocean that long," I say. "Yeah, check your calculations," Miko says, jabbing Kaszira in the ribs. "There's nothing wrong with my calculations," she says, punching him back. Miko looks around the deck, searching for something to break, but then stops dead right next to the helm. "Do you see that?" Barnacles cling to the ship's deck, the only thing that's keeping it from falling apart completely. But there's one area where the barnacles grow in an odd circular pattern. Miko presses his hand through the brittle wood. 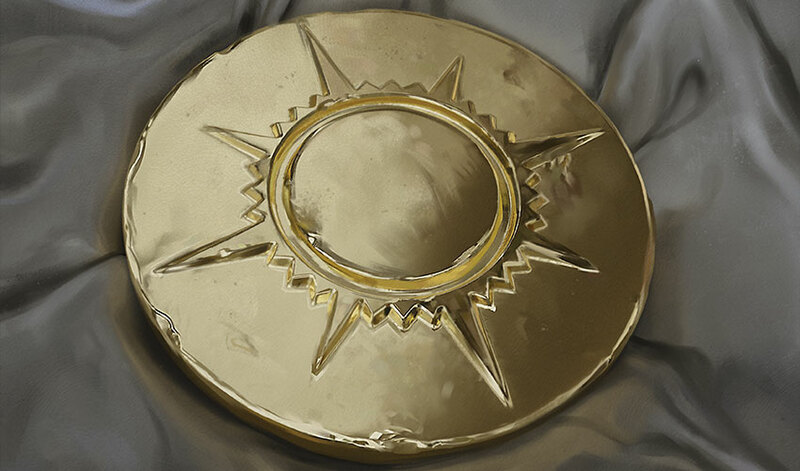 It gives, and when he pulls his hands back out, he's holding a golden medallion as big as his face, bearing the symbol of a bloated, eight-legged starfish. "This has got to be worth some shells!" he says, yanking at the rope it's attached to, but the knots hold firm. "Passage . . ." the raspy voice says again. "Who's there?" I say, gathering the students toward me. "Show yourself!" I expect some merfolk prankster to swim out. I wouldn't put it above Ptero to orchestrate such an awful ruse, but when a figure emerges from the mangled collection of waterlogged wood that once was the stern of the ship, chills ravage me through and through. It's a portly figure, well-built for the near-freezing temperatures of these deep waters, clad in a simple gray frock. It has no discernable fins. Human, perhaps. I've seen a few such curious creatures, but they all either had genetic modifications or clunky apparatus to breathe beneath the water. They were awkward swimmers and moved with the grace of a drunken seahorse. This human doesn't move like that, though. Doesn't move much at all, in fact, but it's steadily coming nearer. A school of spooked angel barbs makes an escape from our intrusion, barreling right through the human's body, which now seems less substantial than jellyflesh. Miko lets loose a bloodcurdling battle cry, then drops the medallion and throws his hands up in defense against the human. "What is that? Some kind of ooze mutant?" he yells. The human locks eyes with Miko. "Passage . . ." it moans. "It's a ghost," Kaszira says, approaching the human like it's a wild ray. "It can't hurt us. I think." "What do you want from us?" I demand. "Hooome," he says, the word drawn out like his mouth has forgotten how to speak. "Passage home." "You're from the upworld?" Kaszira says excitedly. "The drylands?" The ghost nods. "Ship wrecked. Crew drowned. Except me." He passes a hand through his midsection. "Already dead." "Poor thing," Kaszira says, swimming too close to the ghost for my comfort. "Get back, Kaszira," says Miko, fists still drawn. "He's scared, can't you see? Down here, all alone for years and years." Kaszira sits upon a trunk, next to the ghost. "Just give him a moment to warm up. To remember what it's like to be with other people." Kaszira is showing empathy. And Miko is using his observation skills for a change. I know I should be thinking about getting my class as far away from this wreck as I can, but if exposure to this odd predicament is enough to shock these two into improving their weakest areas, they might both have a chance at a good showing. It truly seems as if this ghost has no dominion over ocean life, and as such, doesn't seem to be an immediate threat. "What manner of beast are ye?" the ghost asks, each of the dry words slow and grating against my ears. 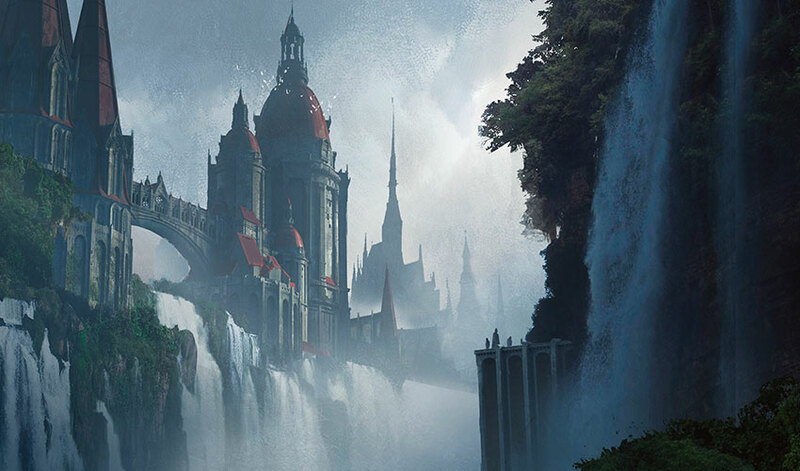 "Haven't seen nothing like ye in all of Ravnica." "Merfolk, eh? Ah, beasts of the water, then." He clears his throat several times, but it doesn't resolve the rasp. "I am seaman Andrik, most unfortunate sole survivor of the Heckless. Ship was sunk by pirates, long ago. Sat at the bottom of the river for decades, my only pleasure watching the glimmer of sunlight reaching through the blue. Sad sight it was, but I didn't know how good I had it, until the riverbed started sinking, sinking. Swallowed the whole ship and me with it, down a hole and into this here dark and wretched hellscape. I'd given up on seeing a living soul some time ago." "He fell through one of the zonots," Kaszira says, almost a whisper. "Sinkholes big enough to swallow up a vessel! Imagine!" I'm imagining . . . something quite improper. I imagine the confidence my students would gain by helping this poor ghost get back home, and the experience they'd pick up going on a real-world adventure. "We will help you with passage home," I say, "On the condition that you obey our commands. The sea is dangerous, and I won't have you putting me or my students at risk." "And on the condition we can keep this!" Miko raises up the medallion again, eyeing the rope tether impishly. If there's anyone who can break it loose, it's him. The ghost shakes his head. "I'd like you to have that. I really would, but I fear it be a family trinket of no real value. Fake gold. But on your other condition, I do consent. All commands will be obeyed, if only you can reunite me and my ship with the bright blue sky." "Aww," Miko says, laying the medallion back down. "Why don't you just swim back up to the surface? It's not really that far." "My conscience is too heavy, I fear. The remains of the crew are still aboard this ship, and I wouldn't feel fit making that journey without them. It's my sole wish that their families can see them to a proper burial." When I present the idea to the other students, half are excited about it, the other half, less so. "It will be dangerous," I say. "But if we hold by the ways of the protectors, we will pass safely. We know that 'empathy' is the first tenet of merfolk protectorates. Who deserves more empathy than a ghost, kept away from his people for nearly a hundred years? And if we show him no mercy, he'll likely sit here for a hundred more." Two more students agree to come, but there is one holdout: Chessa. "The risks are too great, Tender Medge," she says. "How will we get the ship past the krasis?" "We observe. We conceal. And if that goes wrong, we fight," Kaszira says, swirling her index finger in circles, creating a vortex of bubbles. Magic flows toward her, bright blue whirls of fine tendrils. "We know the spells. We're ready to use them. Is it not our calling to protect the creatures that need protecting?" The other students applaud Kaszira, and Chessa's fin colorings fade in embarrassment. "Of course," she says, trying to save face. "Of course." The students set to task, lightening the load of the ship, emptying the cargo hold of barrels. Miko and Kaszira go to lift the trunk on the deck to toss it over, but the ghost steps up to them. "Not that one," he says. "That trunk contains our sacred tomes, the Divine Contract, carved upon six white granite tablets, dutifully bearing of the pontifications of Grandfather Karlov himself! We were of a humble lot, sailing the rivers of Ravnica to spread the good word of Orzhova! And for shame, our ship was wrecked by the feckless whims of pirates." Miko drops his end of the trunk, a brow raised. "Okay . . ." he says, then whispers to me, "I kind of liked him better when he was just moaning." But then Miko gets the bright idea to scavenge the amphibious beast's vocal sac, one of the few bits leftover on the carcass, using it as a balloon to fill the hull with air and make it more buoyant. He putties the punctures with bass tar, and then we wedge the sac inside the boat and start to inflate it. We spend nearly an hour and a half of constant blowing, but the ship starts to shift in the ocean bed. Kaszira and a couple other students conjure the concealment spells, storing them within conch shells so we can use them in an instant on our passage to Zonot Five. It isn't the closest zonot, but I hear they allow all manner of visitors, so hopefully we won't have trouble surfacing there. Five students guide the boat, and I put my best observers at the bow, on the lookout for krasis. When we spot those threatening shadows passing over us, we veer in the opposite direction. The students work so well together, I'm overcome with a sense of calm. They've all claimed a spot in the winners' shell of my heart. As the water clears, the zonot comes into view, a bright cylindrical opening shimmering light from the surface, all rippling in the distance. Flecks of flotsam passing beneath the zonot catch the light. Then I realize that's not flotsam. It's people. And just as the immense scale of the zonot really starts to sink in, Miko yells "Krasis!" Darkness spreads overhead, a massive shadow. Part shark, part crab—all teeth and claws. "Conceal, conceal!" I say. And together, we draw upon the magic stored within the shells and press our hands against the hull of the ship. The old wreck fades into a rippling blue haze, like the water itself. The krasis passes right over us, coming within feet. Miko almost reaches up to touch it. Almost, but I shoot him a stare as cold as the sea depths. The ghost starts to fidget as we finally near the zonot. I'm nervous, too. I've only heard of them until now, and I denied that anything made by the upworlders could be as beautiful as they claimed it to be, but it is. Luminous green baubles line the sinkhole's walls, as if they were encouraged to grow that way instead of being stacked by hand. Plant life winds itself into the structure, providing natural support as well as natural beauty. The lab space above seems to be a mix of air and aquatics, and above that, thousands of people meander up a vast spiral stairway. "Wasn't all this when I came through the drain," the ghost says, eyeing the Guardians that hold watch at the base of the zonot. 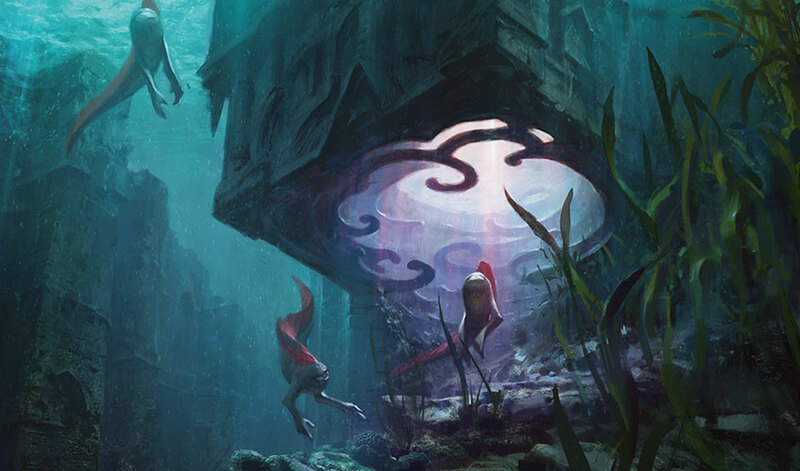 A group of three merfolk swim up to the frog mutant guards, surrender some coinage, and after a brief inspection, they are allowed through into the zonot. "If we explain your predicament, I'm sure they'll grant us safe passage," Kaszira says. "Let's turn away," mutters the ghost. "We'll find another way up." "Your wreck has already lost half of its hull planks," Chessa says. "I don't think it'll last much longer. And we haven't any more concealment spells ready." "Chessa's right," I say. "We should proceed through the zonot. We've already risked so much to get here. The Guardians might look aboard, ask our names and occupations, nothing more. There's nothing to fear." "We cannot!" the ghost screams. The trunk rattles on the deck. Eddies of orange magic surge from the cracks in the lid, like the discharge of deep-sea vents. The waters swell against the ship, and its hull moans. The ghost's soft, tattered edges go hard as it absorbs all that magic, and we get a peek at something much more sinister. Something that definitely poses a threat. The students stiffen their fins in response, ready for a fight. "Who are you really?" demands Miko. "And what's in that trunk?" He goes to open it, and the ghost shudders again, then completely sheds his humble visage. Gone is the tattered frock, and he now stands clad in layers upon layers of opulent robes with several necklaces that appear to be made of golden sand dollars. He glows around the edges, giving him a hostile aura. Waters whip around us, swirling like a riptide. Miko gets a good grip on the trunk and won't let go. The worn lid finally gives out, and the waters turn tornadic, a storm within the sea. Miko bangs his head on the debris and goes still, drifting off. I gasp and give up my hold on the boat to swim after him. The visibility is poor through the turbulence: bubbles and debris everywhere, but I've never lost a student, and I don't intend to lose one now. I find him, pull him close, and then fight my way back. The contents of the chest fly around us, definitely not sacred tomes, but treasure of some kind. Old and beautiful, each piece bears the brand of the Simic Combine. "You stole these," I say. "Your crew wasn't pontificating! You were pirating!" "He could have returned to the upworld decades ago," Kaszira says, "but he was too greedy to leave his treasure behind." "Or maybe he didn't leave because he couldn't leave," says Chessa, frantically scraping the barnacles off the medallion. A vortex opens right next to her, trying to rip it from her grip. She holds tight, squinting at the writing. "It's some kind of contractual signet. It's bound to the boat, so he is, too." The water stills. "Put that down, fish," the ghost says, eyes enflamed. Chessa stares back at him, wedges a foot against the deck, then she and Kaszira pull until the entire plank anchoring the medallion's rope comes up. "I'd toss this overboard, but you don't deserve the honor of resting upon the ocean floor," Chessa says. I don't know what's gotten into her, but she swims off with the medallion, toward the krasis we'd just escaped. The ghost is tugged after her, tethered by old yet resilient magic. "Chessa!" I yell out. "Chessa." But she's so strong. So fast, so courageous, I'd never be able to catch up. "Let her go," Miko whispers, just barely conscious. "She needs this." Chessa's reached the krasis, all those sharp teeth gleaming. She teases it, looking like a suitable snack, then when the beast opens its maw, Chessa ducks out of the way and chucks the medallion inside. "Let's see how you like your new master," she says to the ghost as the beast's jaws snap, and the medallion finds its way down the gullet. The krasis's attention turns to the curiosity that is the ghost as Chessa swims away. Teeth gnash futilely through the apparition as he disappears inside the krasis, dragged behind the medallion. The wreck is obliterated, but the class gathers up the Simic artifacts in their arms. We swim up to the zonot and explain to the guardians what had happened. One of the guardians takes interest in a dark piece of iridescent metal with a filigree of shells and claws. She calls over her boss. The elf mage looks down, and his eyes go wide as he carefully picks it up. His mouth gropes for words before he finally says, "If I'm not mistaken, this is Momir Vig's keyrune. Stolen nearly a century ago. There's a popular exhibit about it here in the zonot. Come. I shall bring you to the museum curator, so you can tell your tale." We step out of the water at the base of the zonot, so eager and so curious that even the sudden weight of the upworld pressing upon our bones doesn't slow us down. After traveling a few flights up, though, I wish I'd spent more time in the sea caves, acclimating my body to breathing air. I'm left feeling dizzy, trying to take in all the inventions created by the Simic. My people. Seeing the fruits of the Upwelling, maybe I understand it a little better now. We're fed and allowed to groom our fins in wading pools as the museum staff scurries about in preparation for the installation. Finally, the curator greets us, and we're given a tour of the museum. 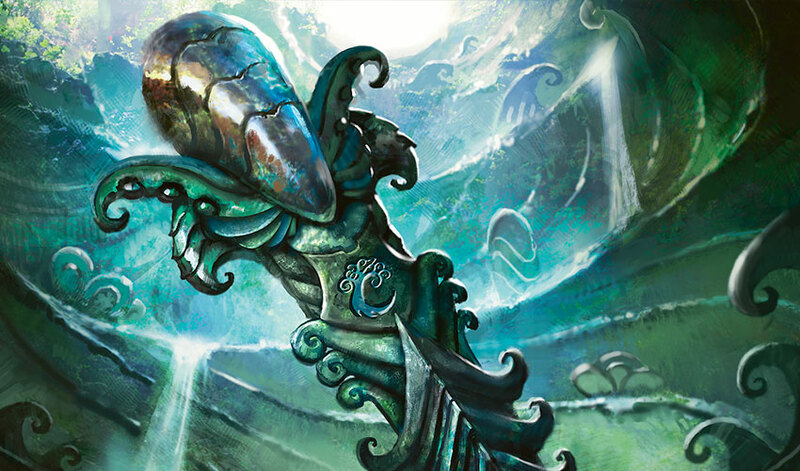 Many eras of Simic history are laid out before us. 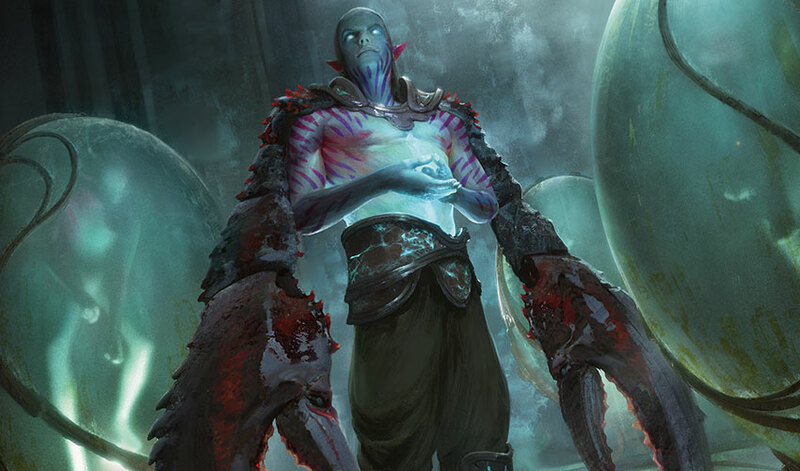 There's an entire section dedicated to the intellectual pursuits of Momir Vig, and the curator directs us to the crowning piece: the last cytoplast Vig had created before his downfall. It stands on a pedestal, surrounded by three guardians. The amorphous blob gleefully undulates under the spotlights, in an eternal wait to connect with some poor soul and manipulate their genetics. I shudder, then turn my attention toward the new exhibit to be unveiled . . .our discovery . . . in front of a throng of museum visitors. "Today is a very important day for us," the curator intones. "One of our lost treasures has been returned to us, and it is my honor to display it here, where it can be observed for centuries to come!" After a lengthy monologue, nearly everyone is peering over each other's shoulders, angling to get their first look at the keyrune used by Momir Vig. They've polished it, and it now shines so brightly, it almost hurts to look at it. Even the guardians watching over the cytoplast have turned their attention to witness such a monumental event. I notice Kaszira has stopped paying attention and is peering through the bubble glass of the next exhibit: a functional lab, with creatures floating in thick gel. Even through the distorted glass, I see them growing, changing, mutating. A shell starts to harden upon soft, young flesh. "If you want to undergo genetic modification," I say to Kaszira. "Then I will appeal to your parents to have you begin treatments. Upon completion, you can retrain for the protectorate under Ptero. Your parents will be sad that you didn't adhere to their Utopian ideas, but if this is where your heart leads you, then you should follow it." Kaszira shakes her head. "I don't want a mutation. And I've always seen the value of Utopian living, but it's not sustainable . . . not with the krasis out there. Perhaps, if I study up here in the zonots, I could figure out how we could change the fight. Maybe we could give resplendent benthids stronger skin or the ability to camouflage. We can give them a chance to survive. We can keep our Utopian ways and balance them with the ways of the Adaptationists." She makes so much sense. Her empathy showing will be unrivaled. And for the first time, I see Kaszira as her own person, not just the niece of a high-ranking official, who will one day make a great splash of her own. "You will make the Combine proud. You already make me proud." I'm proud of all my students: Chessa, Dimas, Laszlo, Saganderis, Fania, Zyanek, and . . . Miko? Where has he run off to? I spot him, his finger inches away from touching the now unguarded cytoplast. "Miko!" I yell. "Stop this instant!" He withdraws his finger and turns toward me, but one of his fins clips the pedestal, and the cytoplast tumbles from its perch. The amorphous blob of living cells falls right toward me. I try to move, but out here, in this oppressive, heavy air, my limbs fail me, and I don't have time to get out of the way. The cytoplast smacks me in the chest. The next moment, I feel an oozy substance crawling over my skin, sinking inside of me, seeking out pieces of me to mutate. Pressure builds. I feel eight of my fins thickening, lengthening. Suckerflesh erupts from their undersides, and upon their tips, bulbous mounds of flesh press out, then blink open. Light slips into my mind, accompanied by more images than I can process. I'm seeing the room from various angles, everything around me caught in my sight. Those things at my tentacle tips, they're eyes. Guardians approach, but before they can apprehend me, my class reacts to the threat, and encircle me, a formidable shield of courage and observation, and if this is our fight, we are ready to make a stand. "Step aside," the guardian says to my students. "This merwoman has destroyed a priceless artifact." "And we've given you a new one. We're even. Let us pass," I demand. "Or else." "Or else, what?" the guardian asks, amused at the threat. I can say that I am not proud of what happens next. I blame it on the confusion of mutating so rapidly, of this too-dry air making my thoughts dizzy. A fight ensues, and after a round of broken fins and broken egos, my class and I are tossed into the zonot's brig. Perhaps it is a good thing knowing that our Combine is not fragile enough to be taken down by a group a preteen merfolk and their newly tentacled teacher. Finally, after hours of silence, the door to the brig opens, and in swims Utopian Speaker Zegana. In person, she is more regal than I'd ever imagined. "Kaszira, my niece," she says. "I have spoken with your parents, and they have expressed extreme displeasure with your actions here." "I am sorry, Aunty." Kaszira slumps forward, fins running limply down her back. "I'm afraid 'sorry' isn't going to undo the damage you have wrought," Zegana says. "You and your friends are to return to merfolk territory immediately and are hereby banned from the zonots." My heart sears. Kaszira will no longer be able pursue her education in here. She'll no longer be able to achieve her dream. I cannot let this pass. "If anyone is to be banned from the zonots, my dear speaker, please let it be me. I have put these children in danger, but it is their only desire to serve the Simic Combine in the best way they know how. Chessa here, has overcome her fears and displayed an extreme act of courage. Miko has proven his observation skills. And Kaszira has not only shown empathy, she's found her calling. She wants to study in the zonots and take her knowledge back to the oceans, where she can help strengthen us all." "Is this true?" Zegana asks of Kaszira. Kaszira nods, now standing tall, straight as a rockfish spine. "It is, Aunty. More than anything." Zegana turns and leaves us without another word. Several minutes later, we're being led out of the cell, then out of the zonot, back into the ocean. I never thought I'd be so excited to see the seabed again. On the day of the showing, Ptero's crab claws quiver as he sees my class, their confidence like an aura around them. And sure enough, each of my students secures a place in the protectorate, except two. Miko . . . because, well, he's Miko, but he's come along further than any of my expectations, and I'll gladly have him repeat with me next year. Kaszira also doesn't claim a space, either. She doesn't appear for her showing at all, in fact. But as my students take their spots upon the pearlescent center stage that is the winners' shell, I see her in the audience . . . dressed in Simic biomancer robes. She's done it. She's going to the zonots to study. "Thanks for giving me the kick in the fin I needed," I say to Ptero as he passes. Nearly half of his clutch had placed. Not as good as he'd expected, but the competition overall was the best I'd seen in years. "No need to mock me," he grumbles, eyeing my tentacles with a palpable jealously. I know I was against adaptations, but this one suits me quite nicely. I can see everything, all around me. There's no way a student will escape my sight now. "I'm not mocking you. I've avoided Adaptationist ideas. You've cast off the Utopian ones. We both embraced the extremes, when we should have taken the time to learn from one another, and to find a place in the middle." He looks up at me, surprised I haven't taken this opportunity to shame him like he's done me so many times. "Maybe next year we can team up," he says, "tend our clutches together. We can assure we're sending the best and brightest out to be our ocean's protectors." Next year. I really like the sound of that, and I have a feeling, it's going to be the best clutch ever.